Tim Boal and I were playing some golf yesterday in a mountainous course in Simi Valley (the Tierra Rejada course). 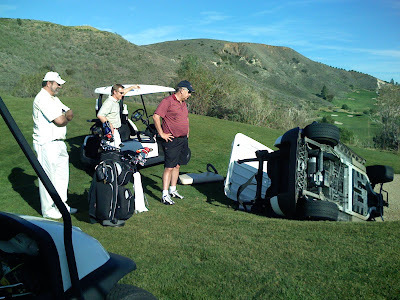 I backed the cart accidentally into a sand trap and flipped the cart over on me. I escaped with bumps and bruises. Tim saw the whole thing and thought I had broken my neck. The picture shows us surveying the damage and watching the batteries drip fluid all over our possessions. We waited for another cart to be delivered and we finished the 18 holes. I am looking for people who would like to play golf with me [at national conference this July] in Florida!